Believe it or not, a little over a year ago, I had no idea about Puglia, let alone where to stay in Lecce. After reading countless blogs on the region, I felt as if I was mysteriously being called there. Puglia is a region in the south of Italy famous for its white washed towns, stunning coastline, olive trees and trulli houses. The more I read about it, the more I wanted to be there. So in April 2016, I started my journey in Lecce. Palazzo Rollo: Oh the baroque! I was kindly hosted by Palazzo Rollo, a 17th century palace, which is now converted to a B&B. My room was attached with a huge lobby, a drawing room, a bathroom with a hot tub and a small private kitchen. It was very homely as I could come and go as I wanted, cook and and eat something in the room and make coffee for myself in the morning. Palazzo Rollo was a wonderful start to my Southern Italian soujourns. The Palazzo is owned by Elena Andretta and her family and was her home while growing up. Elena is very passionate about keeping her forefathers legacy alive and her thinking and traditional values impressed me. She along with her staff member Simona were absolutely wonderful hosts and made sure I saw Lecce with their suggestions. Palazzo Rollo: Elena and Simona. Palazzo Rollo was at a fantastic location as it was only 5 minutes away from all the main attractions. The mornings at the Palazzo were full of fresh Italian cornetti, cold cuts, juices, coffee and fruits. During the day when it was too hot, I came back to take a nap or a shower. One of the days I had a lovely evening on the terrace with a fantastic view of the bell town of the town’s Duomo (main cathedral). I totally recommend staying in Palazzo Rollo for your time in Lecce. It is central, convenient and exceptionally friendly! Disclaimer: I was a guest at Palazzo Rollo but the opinions don’t change. Everything expressed here is solely my own. 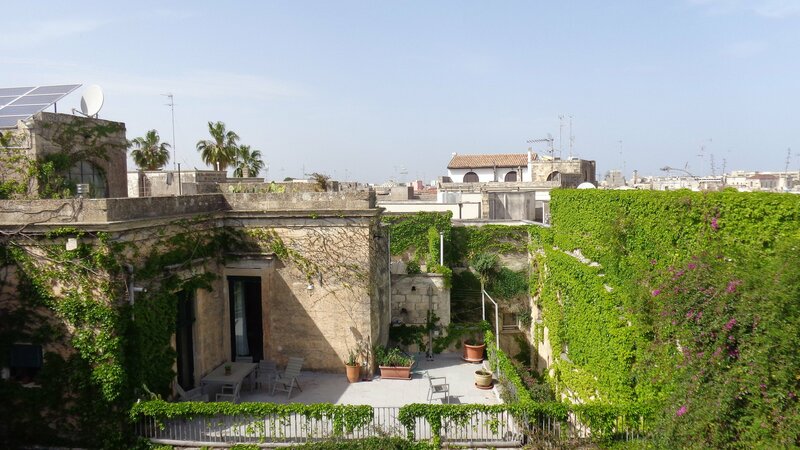 Hey Ish, glad that you had a lovely time at Lecce and the B&B looks so cozy! Your posts are a great source of information for planning a trip to Italy. I was just in San Severo Puglia! Fantastic town and people. Found great wine at Cantina Ariano! Highly recommend. I could feel the overwhelming number of photos that you took. 🙂 Looking forward to your future uploads! Haven’t been south of Roma myself, but sooner or later. Oh, and also here, south of Tuscany, everything is closed between 1 and 4 pm. 🙂 Thanks Manja. Yea lots of places but I guess more in the smaller towns. I hope you are enjoying Tuscany. This place looks amazing! I can see why you enjoyed it so much. Must put it on my list. I have only been to Genoa, Pompeii and Messina so far in Italy. Those are very interesting places too, Darlene! There is so much to see in Italy that it needs more than a lifetime 🙂 I haven’t been to either of yours YET 😉 And yes please visit this pretty little town and amazing B&B. I have been following your Blog since we met in Lecce, and I really have enjoyed it. Love these pictures of Palazzo Rollo, especially the last one of the terrace we had outside the apartment we had there for a month. Thank you so much, I just realized today it is you. Yay! I miss Lecce. don’t you? How are you both and things in Canada? Thank you for this look at Lecce. Puglia is certainly on the list here. Thank you so much Brad, I am sorry I missed replying. Did you visit yet? Not yet. So many places. So little time. Lecce ♡, so beautiful! Glad you had such a great trip! This sounds like a dream Ishita. Hope you get to go back again. You’re sort of making me fall in love with Italy myself. Isn’t surprising because the way you describe it is almost dreamlike. That b&b looks like the perfect reading spot if you’re so inclined. Another great post. Thank you .. That’s so precious! Thank you Susan. That is why we are kindred spirits. I can’t wait to go back already. If only it was soon! Love your blog. Have been to Italy twice and I still feel there is so much more to see. Will surely explore more of south Italy if I ever plan another trip. Thank you so much 🙂 you must. You’ll see a different Italy. You make every place more beautiful with your words.. and it adds up to my “To be Visited” List… This is another one.